A good Travel Agency in Huaraz. we enjoyed the Cordillera Blanca Trekking. 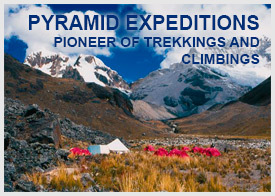 “Pyramid Expeditions” in the Cordillera Blanca, Huayhuash, Cuzco, Puno & Arequipa, Perú. If you need more information about programs and details write us.